The Road to Armageddon . . . . 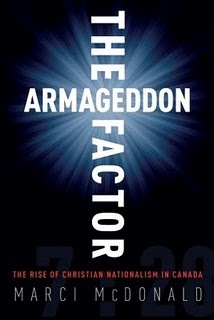 This morning I completed "The Armageddon Factor: The Rise of Christian Nationalism in Canada" by Marci McDonald. Her book is highly recommended as a wake-up call (I hope it's not too late!) for Canadians to avoid the mess religious zealots have ingrained in the US political system. With the short period of time harperco has been in office, the infiltration of "faith-based" radicals is astounding. Some excerpts follow. On both sides of the border, Obama's election was hailed as a tipping point, the moment when a majority of Americans finally revolted against years of overheated piety in favour of an appeal for spiritual tolerance. . . . .
. . . . As it turned out, those elegies were premature. Rather than banishing Bush's faith-based bureaucracy and rhetoric from the White House, Obama has actually outdone him in public religiosity. From the invocation by celebrity pastor Rick Warren at the inauguration to his own address to the Islamic world enunciating his belief in Jesus Christ, he has “embraced faith in a more visible way than any other president in recent memory,” according to Dan Gilgoff, the religion writer for U.S. News & World Report. While Bush was careful, even covert, in his scriptural allusions, Obama opened major presidential rallies with prayers solicited from local pastors, and mentioned Jesus with a frequency his predecessor would never have dared. Instead of scrapping Bush's Office of Faith-Based Initiatives, he expanded its mission and named a new twenty-five-member Faith Advisory Council, prompting Gilgoff, the founder of Beliefnet's “God-o-meter,” to dub him the “faithiest” president in American history. Waving their bright flags on the lawns of the Parliament Buildings, extolling the country's Christian roots to a compelling soft-rock beat, they might seem to offer a refreshing recipe for morality and national pride, but their agenda – while outwardly inclusive and multi-racial – is ultimately exclusionary. In their idealized Christian nation, non-believers – atheists, non-Christians and even Christian secularists – have no place, and those in violation of biblical law, notably homosexuals and adulterers, would merit severe punishment and the sort of shunning that once characterized a society where suspected witches were burned. Theirs is a dark and dangerous vision, one that brooks no dissent and requires the dismantling of key democratic institutions. A preview is on display south of the border, where decades of religious-right triumphs have left a nation bitterly splintered along lines of faith and ideology, trapped in the hysteria of overcharged rhetoric and resentment. On a visit to Canada in late 2006, Pulitzer Prize-winning journalist Chris Hedges was alarmed to discover that, in a country he had always regarded as “a bit saner” than the U.S., Harper was putting out the welcome mat for the religious right. The son of a Presbyterian minister and a; graduate of Harvard Divinity School, Hedges warned Canadians against following the lead of those Americans who “stood sleepily by as Pat Robertson and other religious bigots hijacked the Republican Party and moved into the legislative and executive branches of government.” As he made clear, the growth of the U.S. Christian right was a long and insidious process, but one that could only have happened because the media and political moderates watched in passive disbelief or wishful denial. In tracing the influence of that emergent force in this country, I have attempted to sound a wake-up call, but, in the end, it is up to Canadian voters to write the next chapter. Only they can decide the kind of country in which they want to live. For lack of a better term, Marci, "amen" . . . .
Take this viral and maybe the MSM will have to report it . . . .